Looking for events for paintball? Check out all of the fun events available in the Twin Cities! Action Packed Paintball Games offers multiple scenarios, terrain, fields and tactical environments to create the best paintball experience in the area! Teams will compete against each other behind ammo crates, buildings, tactical settings and more! Badlandz – Experience a southern style event of paintball in the overgrown plateau. Use sand bags and ammo cases for cover on the aggressive desert war terrain. City of Tombstone – Become a part of the wild west shoot out! Stand off on the streets of the western town and maneuver from building to building is how the west is won. Firebase – Play behind ammunition crates and ammo boxes to get to your opponents base. Fighting your way through, around and against the crates is your only way to survive! Speedball – Exploit your adrenaline rush by playing behind inflatable obstacles in close combat! Civil War – Tension will rise as teams line up like the Blue and Gray in the Civil War. Hearts pound, pressure increases and then the stand off begins! The Jungle – Explore deep in the overgrown jungle. Outmaneuver your opponent in the brush, trees, fallen trees and natural landscape. Woods of War – Play the classic style of paintball in the north woods. Tree cover, trails brush, sandbags, buildings and more bunkers separate you from the opposing team. Ambush the other team from the high ground but be careful you don’t get caught first! Reserve your experience online today! Whether you are planning a birthday party, bachelor party, bachelorette party or corporate event, Action Packed Outdoor Paintball Games is perfect! Leave the worries to our staff. Easily plan your event with no hassles. Don’t have any gear? We have everything that you will need for rent! Want to upgrade your experience? More add-ons are available as desired the day of your event such as gloves, shirts, jumpsuits, paint grenades, smoke grenades and more! You may schedule a group or make a private group. Group accommodations range from as small as 2 people or as large as 200 people. Groups sponsoring events for paintball, like a birthday, bachelor or bachelorette parties, youth groups etc may qualify for special discounts. The partying doesn’t have to stop just because of rain. Our facility is rain or shine, which means we create fun all day long no matter what the weather is like. Join our experienced paintball staff at our Jordan paintball park with excellent facility amenities such as paved parking, WiFi, indoor restrooms, shaded areas, grills and more. 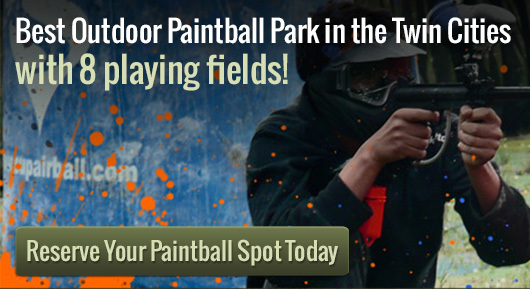 Engage in an exhilarating game of event of paintball. Book your party online or call 952-492-6776 to make your event reservation.